Have you ever taken a mystery quilt class? Before the class, you’re told how much fabric you’ll need, broken down into value categories such as light, medium, and dark. At the class, everyone works through the steps one at a time but only the instructor knows what the final design will be. Although I’ve participated in mystery classes that incidentally incorporate new techniques, the point isn’t to learn something new. I see mystery quilts as an opportunity to test my use of color and value. 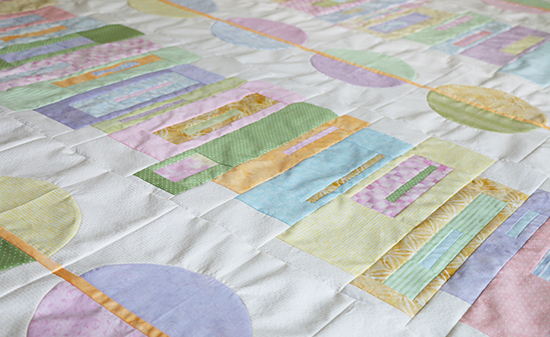 Typically, a quilter knows where each color will be in a design and which colors will be its neighbors. Before any cutting or sewing, fabric choices can be adjusted to ensure that each color makes the statement that the quilter envisions. With a mystery quilt, you don’t know which colors will end up where. Those two busy prints at opposite ends of the value scale might compete with each other in every block. Those medium and medium-dark batiks might look like the same fabric once they’re cut into small squares. Before we moved, I signed up for a modern mystery class. It called for an assortment of medium-value solids or near-solids and a contrasting background. I was able to pull all of the necessary fabric — almost seven yards (6.4 m) — from my stash and was excited to begin. Unfortunately, I was unable to take the class. I bought a copy of the pattern to complete the quilt on my own, even though the design was no longer a mystery. I used the opportunity to adjust the size; the instructions result in a quilt that is 50 by 80 inches (127 x 203 cm), which is too long and skinny for my tastes. I started the rectangles, and had a plan for how many additional blocks I would need to make — then everything was packed for the move. When I pulled the blocks out a few weeks ago, the quantities I had sewn no longer made any sense. But there were more blocks than the pattern called for, so I moved ahead to the next step. I’ll admit, I seriously considered not sewing the semicircles. I like straight lines for my quilt piecing! Not only did I sew them, I made six additional semicircles in order to widen the quilt. I decided to use the suggested layout for the blocks and only had to make an additional five rectangles to widen those rows enough to match the rows of circles. The quilt top is 60 by 78 inches (152 x 198 cm). It’s not large enough to be a bed quilt, but I like the proportions better than those in the pattern. The colors remind me of springtime. I’m not going to name the pattern or the designer, out of respect for others who might take this class in the future. I will say that I found the instructions easy to follow on my own. Curved piecing is still not my favorite, but this quilt gave me plenty of practice. I’d love to hear about your mystery quilt experiences in the comments! It's so pretty! I'm anxious to see the entire top now! I've never done a mystery quilt, mostly because I have to see the design before I can pick fabrics. It would drive me stark raving mad I believe! Thank you, Jayne! 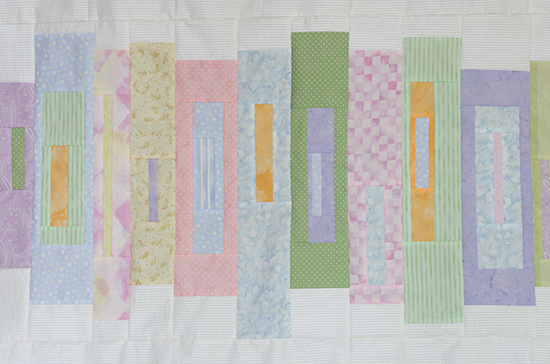 I'm working on the quilting and plan to share the finished quilt soon. 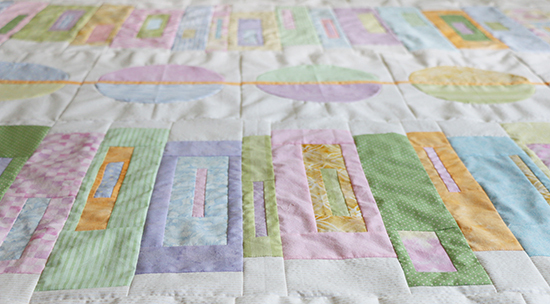 Mystery quilts are definitely a lesson in giving up some control! On the plus side, most of the mysteries I've completed offer a few different options for setting the blocks, or you can always come up with your own layout. Hi Chris, I love the colours you chose. 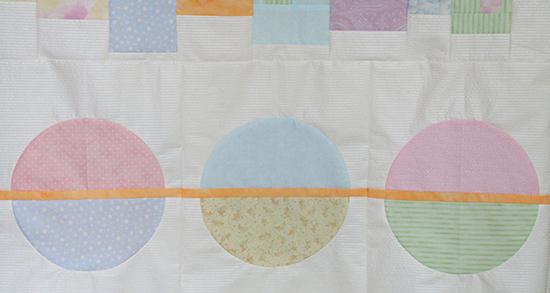 I'm not a big fan of circles but can do them when I have to :-) I'm looking forward to seeing your finished quilt. As for mystery quilts - I haven't made any though I've watched members of my guild make a few. I'm still not tempted - maybe one day. Thanks, Andree! I picked the colors at the end of a long winter, and they still brighten my mood. Mysteries aren't for everyone — I'll quilt them but I won't read them, ha!